This is one of my patterns that I want to use for my new Winter Wardrobe. 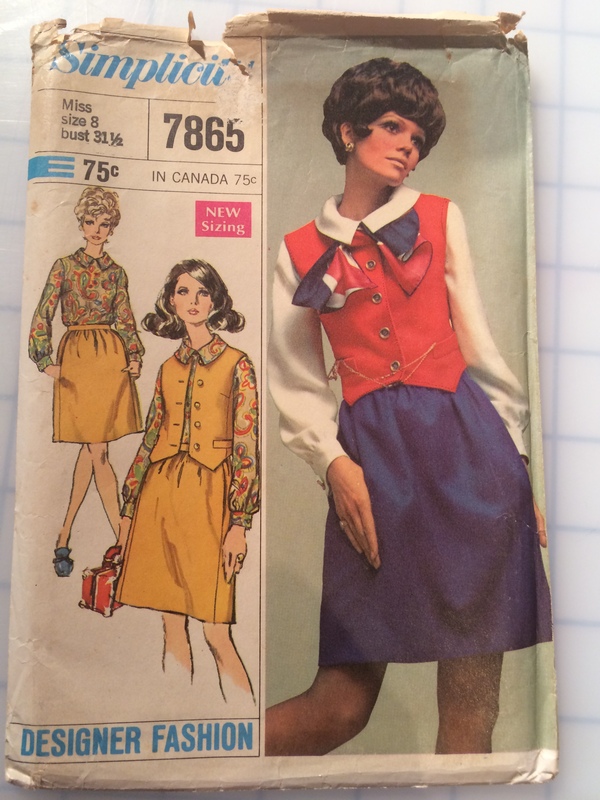 Its Butterick 7865 from 1968. In my mind I had a yellow waistcoat with perhaps a brown skirt and a white blouse. Or maybe red and navy, as in the picture. As ever fabric comes first. I was looking for fabric for Kit’s Christening gown at Misan Fabrics in Berwick Street (remnants are downstairs) and asked charming sales assistant Stephanie for help. Unfortunately we didn’t find the right product although she showed me a silk/cotton mix at £25 a metre. As the robe takes 3m I didn’t go for that. What I did buy was a nice piece of light grey wool, with a nap and a sheen, and possilby some cashmere in it. It was marked as .6m at £19, which wouldn’t be fit for much – too short for a skirt for me for example. So I opened it up and realised that while at its shortest point it was around 60cms, it had a big chunk cut out of it and at its longest part it was maybe around 1m in length. I thought it might make the “vest” or waistcoat in this 1960s “Designer Fashion” pattern. Although grey wasn’t my first choice I do love wearing it. I thought with a white blouse and darker grey skirt it would be a nice basic, or perhaps with a brighter blouse and skirt it would provide a sober element. And a waistcoat appeals to me. I personally like them on a man, so long as he is not too portly. On young skinny men they give a degree of gravity with a bit of daring, perhaps? For women they have not really had a fashion moment recently and they could stand in for a jacket in a warm office, or give an impression of seriousness without being too buttoned up. Anyway I have started, so I will finish. Here is the fabric with the chunk, probably sent off as a decent sized sample at some point, when I laid it out at home. The pattern is quite a small size but as I am slim across the upper chest I figured it would be OK. There is sufficient ease across the bust for me. The only alteration I made was to lengthen it as it needs to come down over the waist band of the skirt. It has welts but no pockets, and it has points on the hemline. I would not have gone for either of these (preferring real pockets rather than fakes, and prefering rounded edges rather than sharp finishes as it is more flattering to my curvy shape). However this is the style of the waistcoat – the welts emphasise the waist and the points elongate the body as well as referencing a traditional look. Of course I could make real pockets but they would be so small I couldn’t use them so what is the point. The model has some sort of chain arrangement which is rather sweet but you can be sure there is no gold watch on the end of it. 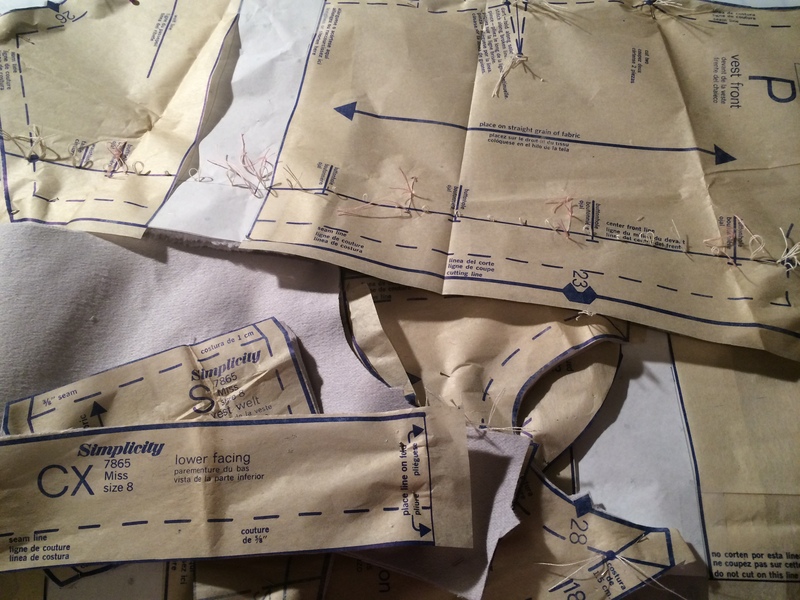 I always quite enjoy the challenge of getting a pattern cut out of a small piece of fabric. 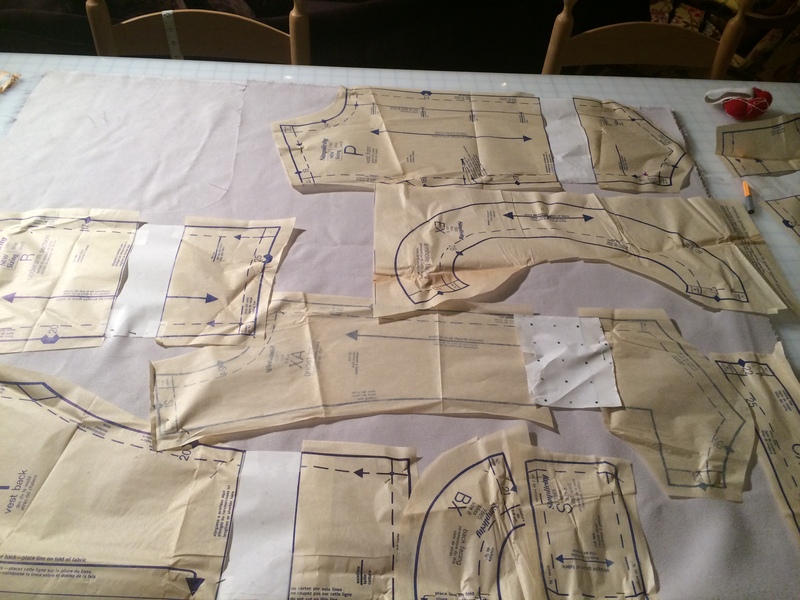 The pattern called for 1m of 54″ fabric without nap. This fabric has a nap (ie direction), but I managed to squeeze it out with plenty left over for bound button holes. Had it been necessary I could have got the facings out of some other cloth, but even when lengthed by two inches my 60cms were sufficient. Phew! Because I had added 2″ to the length I needed to reposition the button holes. If you do this it is quite simple. Stick with the top and bottom placement as determined by your pattern. Measure the length of the CF between and divide by the number of spaces (ie three buttons in the middle – four spaces – divide by four). Then mark the new button holes on the pattern and tailor tack. 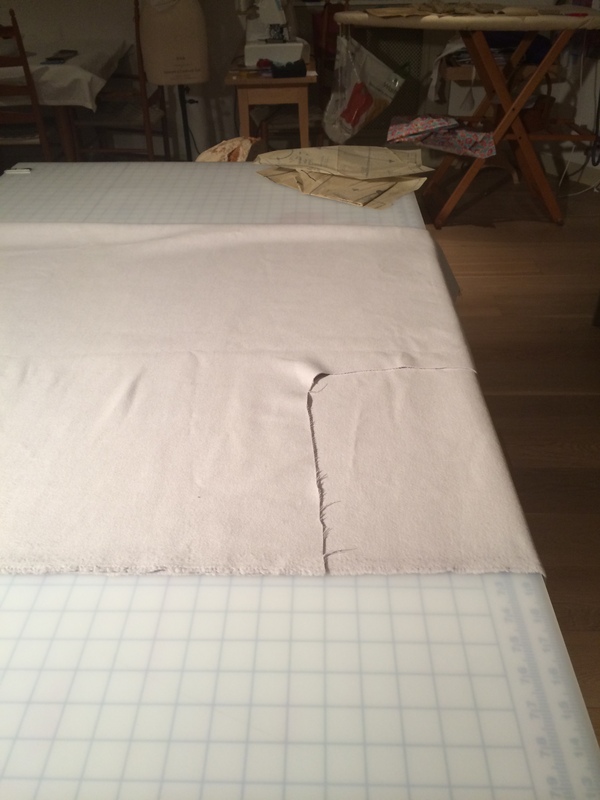 The fabric is fairly thick and getting the seams to lie nice and straight requires quite a lot of pressing. 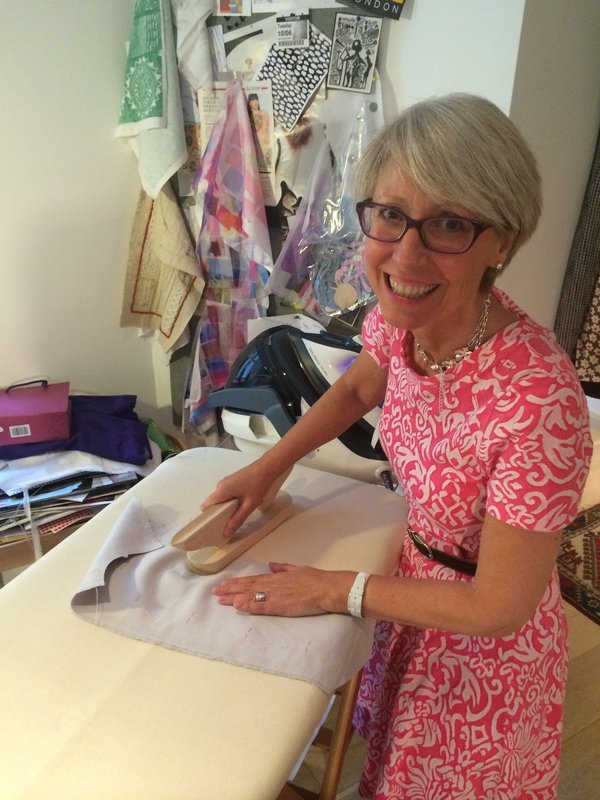 I hover over the seam with the steam iron, then pound them open with my wooden clapper. This is lovely piece of equipment, combined with a points presser. Its useful for pressing open difficult to access seams, and for getting the points of collars nice and sharp. It is used in this case to force the steam into the fabric to make it go slightly floppy so you can effectively mould it to shape. Do you have a waistcoat or vest in your wardrobe or closet? Do you like them on men? Here is a nice eighteenth century one with lots of beautiful, subtle cording decoration. Younger son started in sixth form this month and wears a waistcoat with each of his suits. It’s been interesting to see the impact waistcoats have on others as well as on him when he wears them and I would agree with your suggestions of gravitas and character. Fit is absolutely key; seeing a gap between the waistcoat and a trouser of skirt waistband looks so wrong. I have always enjoyed wearing waistcoats partly for the practical reason of an additional, warm and coordinated layer when wearing formal clothes, so yours waistcoat should be perfect for your winter wardrobe. I love this, Kate!! Thank you too for sharing the construction details – so helpful. I must find a wooden clapper! It’s great to be able to learn from someone who knows what they are doing. I also admire that you’re piecing this out of a small piece of fabric. I once owned a waistcoat that I bought at a second hand shop and wore frequently. It was quite dressy in a high-quality pink wool and looked great with skirts and a blouse, as in your pattern photo. I have no idea why I no longer have it. Come to think of it, I also had another one that I wore frequently. My mom purchased it for me and it wasn’t a high-quality item, but it had different textures and patterns in grey and white in it and I loved it with trousers. Now I know I have to make a waistcoat for this winter! I think they’re great on both men and women. I was already thinking of knitting this tank/vest: http://www.knitrowan.com/designs-and-patterns/patterns/hedy. That is a lovely tank top S. I imagine it’s very soft too – any idea of the colour?